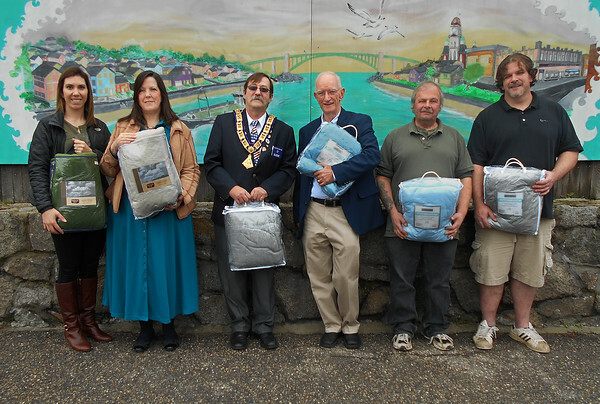 Representatives of the Elks Lodge 892 and Action Inc. gather for a photo Tuesday as the Elks Lodge donated 27 blankets for distribution to the homeless in Gloucester. The local Elks added $300 to a $120 grant from the Massachusetts Elks Association to buy the blankets, which are intended for distribution for people who, for whatever reason, must be turned away from the Action shelter. From left are Maggie Howard, director of client and housing services for Action Inc., Brenda Leahy, an Elks member, Gil Laidlaw, Exalted Ruler of Lodge 892, Tim Riley, Executive Director of Action Inc., Jim Noble, shelter manager and Housing First transition coordinator for Action Inc., and John Cordner, shelter operations coordinator for Action Inc.